Life Coach Directory blogger Kat shares her thoughts on The Happiness Planner after completing her first 52-week journal. In the summer of last year, I was lacking motivation and generally not feeling as happy as I thought I could be. I heard about the Happiness Planner, a journal that contains exercises and prompts to encourage self-reflection, motivation and overall happiness. 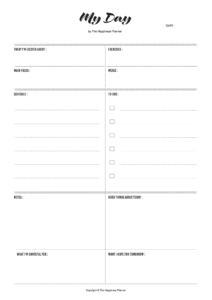 A few weeks into using it, I wrote my thoughts on the planner here on the Life Coach Directory blog. I’ve now completed this 52-week journal and thought it would be interesting to look back and see what difference it actually made to my happiness. Honestly? Yes, I am. And I have the numbers to back it up. Every week in the planner you note down scores for your happiness, how calm you are, how excited, how energetic and how healthy you feel. At the end of the 52 weeks, you input these numbers into one chart so you can see how things have changed over the year. Looking back at my numbers, I can see improvements across the board. I was averaging at around 14 out of a possible top score of 25 per week at the beginning, this improves to scores of 20, 21 and 22 towards the end of the 52 weeks. There are a hundred reasons why my overall happiness may have improved during those 52 weeks, but I honestly believe the small prompts and self-reflection have made an impact. I think the planner’s biggest selling point is not that it makes you happier – it doesn’t. What it does is helps you learn more about yourself and gain better self-awareness. Its biggest selling point, therefore, is developing self-awareness. Through this, you can figure out what makes you happy. Once you know the things you need to help you feel happy, calm and connected, you can ensure you include these in your life. For me, this means learning what I need in my life to feel happy and making these things a priority. They can be as simple as practising yoga and as complex as feeling loved. 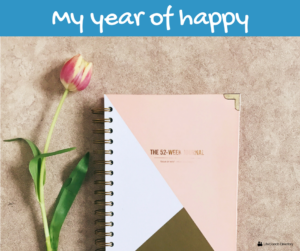 Of course, the beauty of the Happiness Planner is that all these prompts are laid out for you – perfect for someone like me who wants to improve their happiness, but isn’t willing to spend hours on it! Not sure if journaling is for you? Check out the free resources available from the Happiness Planner, so you can try before you buy! Pick a time of day you want to journal and make it a part of your daily routine. For me, it was at night before I went to bed. Keep your journal visible. If you tuck your journal away in a drawer, chances are you’ll quickly forget about it. Keep it somewhere you’ll see it for a visual prompt. I kept mine on my bedside table so I saw it every night before I went to bed. If you forget one day, don’t stress. Don’t dismiss the concept of journaling if you forget to fill it in the odd day here and there, just pick it up and fill it in the following day. It should be enjoyable – not a chore. Do you journal? What do you get out of it? Join the discussion on Facebook! The power of story telling A 10 minute exercise to… become unstuck!